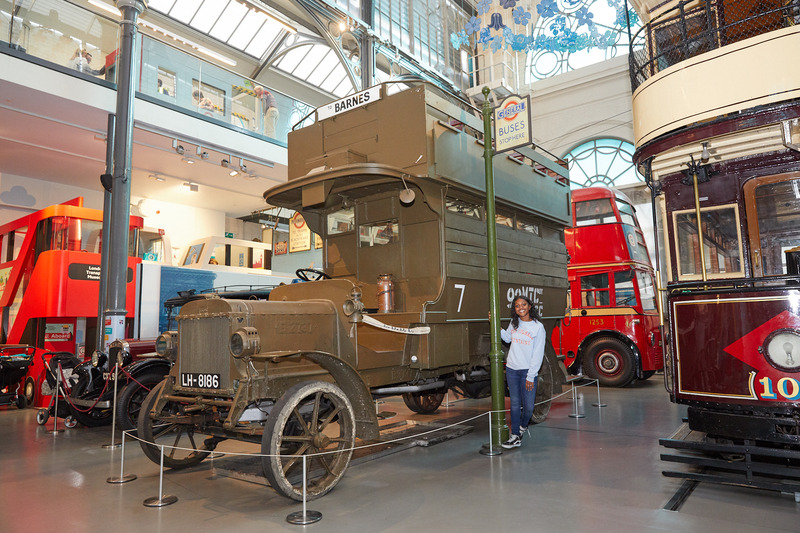 On your visit to the London Transport Museum, you’re sure to notice our new Forget Me Not display hanging beautifully above Battle Bus while it is on display at the Museum for the first time. The new installation, created by artist Jacqui Symons was commissioned to remember the thousands of transport workers involved in the First World War and comprises over 100 flowers to represent the hand embroidered postcards that soldiers sent to their loved ones from the front lines. How was the installation created? Kamiah and Jenna: As part of the Battle Bus project, we commissioned artist Jacqui Symons to work with us on creating a new installation that would hang over Battle Bus. We wanted this work to be co-created with past partners and project participants who had been involved with Battle Bus over the 5 years of the project. We held workshops at Lancasterian Primary School in Tottenham, Holloway bus garage and Walworth bus depot, as well as a drop-in session for staff and volunteers who had been involved with the project. During these workshops, participants drew pictures inspired by images from our collection of the B-type buses during the First World War and the role of transport workers, both men and women, during this time. Some of the participants also then created a mono print of their picture. Jacqui used all of these illustrations to decorate the flower shapes that make up the installation. What inspired you to get involved, Jacqui? I have been making suspended installations for almost 10 years and I jumped at the chance to do one for London Transport Museum especially as the theme of the exhibition and the suspended installation really inspired me. I found the history of the Battle Bus and London transport workers through the First World War really interesting – I especially liked that women became mechanics and conductors for London’s transport during this time. What was your inspiration for the piece? The initial inspiration for the Forget-Me-Not installation were the embroidered postcards that soldiers sent back to their loved ones from the front line during the First World War. Many of these featured flowers and used Floriography (the language of flowers) to send messages of love, hope and remembrance. These flowers now make up the installation, recreated in wonderful colours and suspended in the shape of three flying postcards. Working with groups and communities is a large part of my practice and it was important to me to include exact versions of people’s artwork within the final piece, so each flower features drawings created by workshop participants around the theme of remembrance. How were the flowers made? The flowers are made from laser-cut plywood and screen-printed with participants’ drawings. Over several months, we worked with various groups to create drawings and monoprints using the theme of remembrance and the Battle Bus as inspiration. We got hundreds of great drawings and prints which were scanned in and exposed onto large scale silk-screens ready for screenprinting. Once we had agreed on the final flowers to include in the installation, I drew them up on the computer and they were sent off to a laser-cutting company along with 12 large sheets of plywood that I pre-painted in 12 different colours. 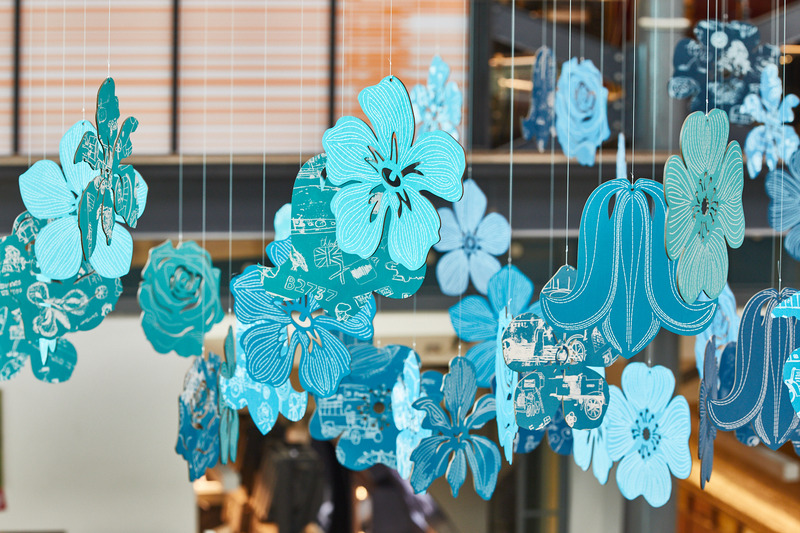 These cut-out flowers were then individually screen-printed with drawings from the creative workshops. Do you have a favourite illustration incorporated within the flower design? Too many to mention! I love them all really. Once you have worked so long with each drawing (scanning them in, creating layouts, optimising them for screen-printing, then printing all the designs) you become intimately familiar with them and appreciate each one for its character and style. What do you hope LTM visitors will take away from seeing the Forget Me Not display? The installation was created to remember the thousands of transport workers involved in the First World War, including over 1,400 individuals who sadly lost their lives. We hope that we can share this story with visitors through the installation and the Battle Bus, so that they are still remembered as the centenary of the First World War approaches. We also hope that visitors will come away with an interest in and some newfound knowledge of the Battle Bus and London’s transport workers and an appreciation of the installation and the meaning of flowers. Also, hopefully, it will inspire visitors to do some drawing once they have seen all the wonderful artwork on the flowers! Come and see the Forget Me Not installation at London Transport Museum, to help us remember the important contribution made by London’s transport workers during the First World War, one hundred years ago. Battle bus will be participating in the civilian procession – A Nation’s Thank You – on Sunday 11 November, to pay tribute to the sacrifice made by London bus drivers who left their regular routes to enlist and serve on the Western Front. Find out more on our website. After Remembrance Sunday, bus B2737, known as Battle Bus, will return to London Transport Museum where it will be on display until spring 2019. Join us at the Museum on 10 and 11 November between 11:00 to 15:45 to learn more about our B-type Battle Bus which played an important role in the war effort. Then join us to make simple poppy pins as part of the remembrance weekend commemorations.